The Tampa Bay Rays have held many great in-game promotions this season, but this one takes the wedding cake. 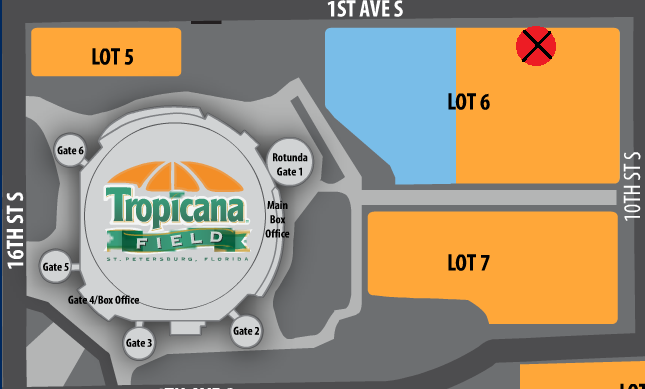 After the June 15th game against the Kansas City Royals, Rays fans will have the opportunity to renew their marriage vows on the field at Tropicana Field. It isn't very often that you will get a chance to renew your dedication to your first love while enjoying the rush and excitement of your second. Post game access to the field to say their "I Do's"
To purchase your wristbands or for more details, please visit raysbaseball.com/renewyourvows. 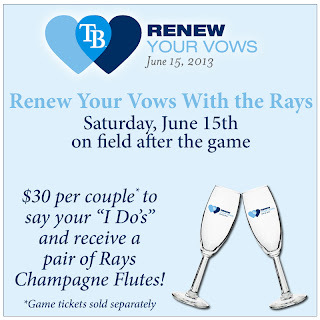 *Please note that Renew Your Vows wristbands do not give you access to the game. Wristbands must be purchased in addition to game tickets & the deadline to buy is 6/13/13. We all know Kyle Farnsworth is a huge fan of paintball, but apparently he is no longer alone on the Tampa Bay Rays. On the team's first day off during spring training, several of the players went out to play some paintball with the Tampa Bay Damage. The Tampa Bay Damage are a professional paintball team representing our local area. The players making it out to participate were David Price, Matt Moore, Jeff Niemann, Kyle Farnsworth, Sean Rodriguez, Tim Beckham, Matt Bushman, Marquis Fleming & Kirby Yates. You can check out their experience in the video below or read about it on Social Paintball. At 1:19, I hear a scream. Is that David Price?? Rays Rally was ranked #98 by CouponAudit.com in their list of the top 100 sports blogs to follow in 2013. We are flattered to be on anyone's list and hope to make it worth your while in what promises to be a very exciting 2013 season! It's that time of year and we have a chance to send a REAL Tampa Bay Rays fan to the MLB Fan Cave in New York City. If you remember last year, the only "Rays fan" that we had to choose from was also a fan of the New York Yankees. I know what you're thinking, and it really isn't possible. Our Rays representative for the 2013 season is Stephanie Katz (@SkittyKatz) from Lakeland, FL. She is a true Rays die-hard and is also a co-founder of the Rodney's Archery Club (@RACRays). If she makes it to the Fan Cave, she will be one of 9 fans that will "live" in the cave and attempt to watch every game of the 2013 MLB season. The cave dwellers will chronicle their experiences for all to see and compete in challenges until there is only one fan left. Please follow our lead by voting for Stephanie to represent us in the MLB Fan Cave. There is no limit to how many times you can vote, so vote now & vote often! It's time to to get our fan base into the positive national spotlight! Follow the voting progress with Twitter Hashtag #VoteSkitty. If you're anything like me, Spring Training cannot come fast enough! Well it should comfort you a little to know that it is right around the corner. Below are some important Spring Training dates along with the Rays full preseason schedule. Dates, Times & Locations are schedule to change.